How I suppose to attach this plate to the camera ? Using a screwdriver ??? It's not quick at all I must miss something here ! Anyone has a vanguard ball head ? please help ! I have never used that particular ballhead/plate combination. However, the plate is suppose to be attached to the camera base and then just stay there attached all the time. The quick aspect is then the mounting and dismounting of the camera & plate (the combined unit) on to the clamp assembly of the ballhead. 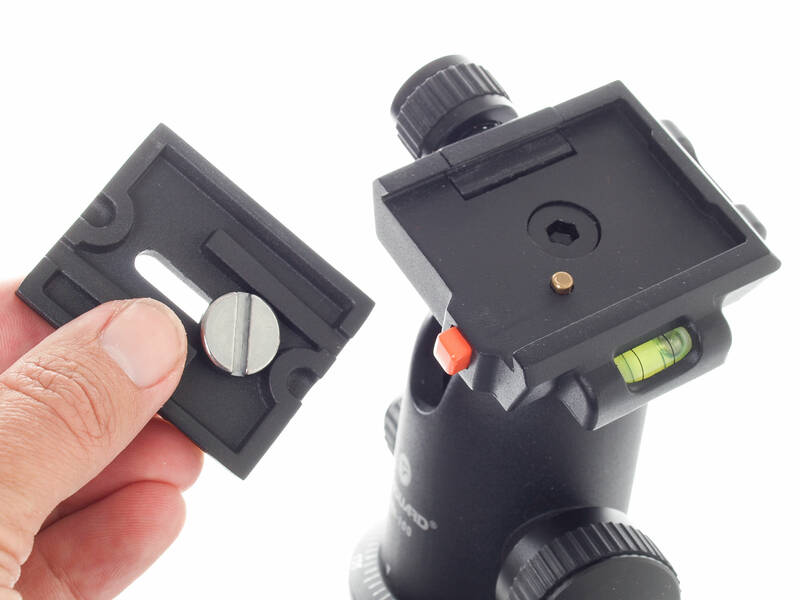 There is a large level on the clamp assembly that is used to mount and dismount the camera & plate on to the ballhead. Attaching the plate to the camera is through the screw (bolt) on the plate. The bolt holds the plate to the camera base by screwing into the camera base. The head of the bolt (and I have found pictures of every aspect of the ballhead except what the head of the bolt looks like to confirm this) is usually either 1) a slotted bolt head - for using a screwdriver, or a coin in a pinch (see the video below); or 2) a hex bolt head - for use with an Allen Wrench (looks like an L, with 6 sides to it. The Allen Wrench should have been included in the package, otherwise any hardware store would have a set of Allen Wrenches that can be bought pretty inexpensively). Here is a video that shows most of the aspects of the ballhead. I have the SB-100, an excellent and great value item. It is attached to my Manfrotto 055B tripod. Great advice above. The quick release works well. I keep a suitably sized coin in my bag for tightening the plate to the camera. I remove the plate when not using the tripod. That completely destroys the benefits of quickly swapping the camera on/off. What makes you prefer to do it this way? I mean that I attach the plate to the camera WHEN I'm taking the tripod out to use, which is probably only about 10 percent of my photography. I don't have to take it on and off on a shoot, because invariably I'm using the tripod for every shot if I have taken it, sort of on dedicated. 'serious' landscape outings. As well, the base plate breaks the smooth line of the base of the camera, tipping it forwards, or catching on things more in the bag. And finally, perhaps irrationally ? ....I feel that the pressure from the screw into the thread on the camera base would not be good for the camera if exerted permanently. My plate (arguably, a very thin one from Sirui) is attached permanently to the camera. I feel naked without it. Coming from Kirk plate land (arca swiss) where everything is torqued crazy tight with an allen wrench - I don't like removing them or adding them but I do sometimes for weight savings. My assumption - remember I've been shooting since when cameras were super heavy and metal always - is that these are engineered to take it. Otherwise putting a modestly heavy lens without a tripod foot onto the camera means that the camera on the tripod would slip around otherwise. I have 2 heads - a ballhead (Acratech GP) and a geared head (Manfrotto 410), each arca swiss. I have an L bracket that lives full time on my camera body - I never take it off. But I shoot mostly from a tripod, usually late evening or at night. Actually, it's better (in the very long run) to leave it on than to remove and insert it back again many many times.